Born c.278 AD, Marcus Aurelius Valerius Maxentius was the son of Maximianus and Eutropia. When his father was promoted to co-emperor of the Roman Empire by Diocletian in 285, it was assumed he would follow in his father’s footsteps and eventually be declared emperor as well. However, when Diocletian and Maximianus retired and abdicated, Maxentius and Constantine I were passed over and the previous Caesars, Constantius Chlorus and Galerius became co-Augustii and promoted Severus II and Maximinus II Daia to co-Caesarii. Constantius Chlorus was the father of Constantine I and Galerius was the father-in-law of Maxentius, through the marriage of his daughter, Valeria Maximilla. After Constantius died in 306, Constantine I was promoted to Caesar. In later 306, the Tetrarchy was planning to disband the remaining praetorian guard and tax the city of Rome the same as the rest of the empire. That led to a revolt in the city and Maxentius was asked by the city officers to take the position of emperor. He accepted and was proclaimed emperor, taking the titles of Caesar and Princeps on October 28, 306, although technically it was a usurpation. The Tetrarchy had a lot of territory split up among the four legitimate rulers and Severus II was the first to march on Maxentius, in early 307. 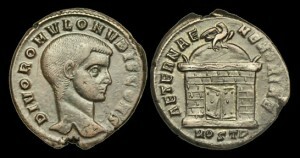 Maxentius had the luxury of commanding the army that served under his father, which included many veterans who saw Maxentius as the rightful heir. As Severus approached Rome, many of his troops defected to Maxentius, as they too served under the previous emperor. Maximianus decided to come out of retirement and return to Rome to support his son and Severus surrendered. This now gave Maxentius rule over central and southern Italy, Corsica, Sardinia, Sicily and the African territories, as well as the lands Severus previously controlled – northern Italy to the Alps and east to the Istrian peninsula. Galerius decided he needed to handle this new matter of father and son personally, and marched on Rome in summer 307, with an even larger army than what Severus had. Maxentius employed the same successful strategy as the previous encounter and was able to convince much of Galerius’s troops to defect through the promise of a large donation of funds. Galerius was forced to retreat and during this period, Severus was executed. Maxentius wanted to legitimize his title and offered to meet with Constantine I and in summer 307, Maximianus traveled to Gaul and gave his daughter, Fausta, hand in marriage to Constantine and promoted him from Caesar to Augustus. Even though Constantine was now part of the family, he didn’t want to cause conflict with Galerius, so he stayed in the background while Maxentius was making his moves. In early 308, Maximianus decided retirement wasn’t for him and attempted to overthrow Maxentius in Rome. It failed and Maximianus had to flee to Constantine. The official Tetrarchy held a conference at Carnuntum in Autumn 308 to discuss what to do about Maxentius, concluding that he still shouldn’t be given the recognition. Instead, Licinius I was promoted to Augustus and tasked with ridding the empire of the usurper. In late 308, the critical food supplier, African provinces, seceded and promoted Domitius Alexander as their leader. In 309, Maxentius’s son, Romulus died and later that year, or early 310, Maximianus died. Maxentius realized things were not going well for him and allied with Maximinus II Daia to thwart the growing threat of Licinius and Constantine. Maxentius sent his praetorian prefect to retake Africa in late 310/early 311. Galerius fell ill and died in 311, leaving only three remaining tetrarchs. In summer 311, Maxentius declared war on Constantine. Constantine, in turn, offered his sister, Constantia, hand in marriage to Licinius, which Maximinus saw as a direct affront to his position. With the lines firmly drawn, Constantine marched on Rome and in October 312, defeated Maxentius in the Battle of the Milvian Bridge, where Maxentius fell into the Tiber River and drowned.